When I was in college at Haverford College, once a month or so, the Haverford dining center has a dinner special called Pastabilities, that just about the entire student body looked forward to. Pastabilities basically involved stir fry pans where students could pick their own ingrediants to be mixed in with the pasta of their choice, to create their own pasta dish. This was by far and away the most popular night at the dining center (yes, even more so than chicken tender night). My concept for dinner tonight reminded me a little of those days. I decided that I wanted tonight's pasta to be as green as possible (which meant no juicy red tomatoes), so I basically took every vegetable I could find in the kitchen that was green, yellow or white. I diced them all together and cooked in our saute pan with some olive oil and spices. All of the senses are pretty important when it comes to food. Taste and smell are the obvious ones - you're not going to eat something that tastes or smells unappealing. However, our sense of sight when it comes to food is underrated. I wanted to create a visual appeal with this dish by the use of color, having a strong sense of fresh green, created by various vegetables from our local market (I can't wait to make this again when the farmer's market returns in the late spring). For this reason, I felt the presentation would be better without the use of red tomatoes (though perhaps yellow tomatoes would have been a fine addition, had they been seasonally available). Also, my husband sometimes finds tomatoes to be a bit harsh on his stomach. To prepare the dish, saute the onions, shallots and anaheim chile to the olive oil, and cook on medium high, until soft. 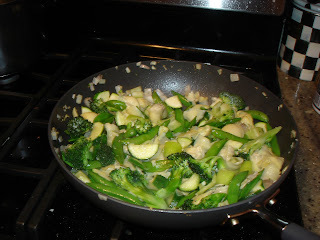 Add the sugar snap peas, broccoli, artichoke hearts and zucchini, and cook for about 10 minutes, until all of the vegetables are cooked to your liking. Mix in the saffron, thyme, salt and pepper towards the end. Aftertaking off the heat, mix with the juice of half of a lemon, squeezed fresh, and stir in the penne. Serve hot. The use of the spices here is key. While a lot of other spices might be overpowering, saffron and thyme give a perfect, unique flavor to this dish, and the lemon provides an excellent pick-me-up freshness. This dish is obviously a great kosher, vegetarian, or otherwise healthy meal, and I highly recommend it with farm to table ingredients from a local farmer's market sometime other than the dead of winter. This was a pretty off-the cuff experiemental recipe for me, especially the choice to use saffron, but it was a huge success. 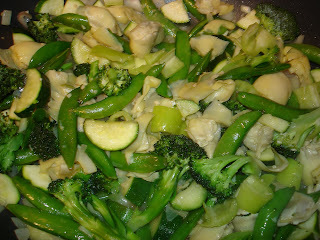 I plan on making this healthy vegetable medley again, very soon! Coming soon from my kitchen to this site: how to make limoncello, honey-vanilla cupcakes, date spread with goat cheese, berry tarts and carrot-potato souffles. 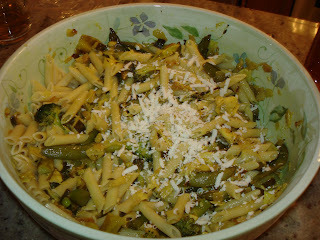 Saw your link from the Foodista post- you make penne look fabulous! This is a splendid dish. My personal preference however is to also include some soy sauce or terayaki with the pasta. It helps achieve a certain balance with the lemon. Either way though it's a very enjoyable meal. I'm going to try this recipe for dinner this week. It sounds and looks great.